Friendship becomes increasingly important to people the older they get, according to a new survey. Around eight out of 10 (83%) pensioners believe friendship becomes more important in later life when their children grow up and loved ones pass away, the Age UK poll revealed. Almost half (48%) of respondents in the survey said it becomes more difficult for them to make new friends as the years pass. Nevertheless more than half (54%) said they still have a best friend and two-thirds (66%) of them reported that they have known their best friend for more than 20 years. 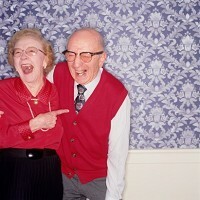 Around one in eight (12%) pensioners in the survey said they are currently looking for a new relationship. Age UK spokesperson Lucy Harmer said how people choose to spend their spare time and who they spend it with "can have a huge impact on wellbeing and happiness". The organisation questioned 2,000 people aged 65 or over for the poll. Holidays are of course a recognised way to meet new people and broaden social networks and for older people there are specially tailored seniors travel insurance policies available to help them do just that.